GT is a bike brand with some pretty serious credentials, and about as much history manufacturing off-road cycles as it’s possible to have — about 30 years. The company started putting together BMX bikes in 1979 but quickly joined the new mountain bike craze sweeping the US. The brand stumbled in the Noughties, going bankrupt and then producing mediocre bikes, but it’s coming back strongly after becoming part of CSG – Cycle Sports Group, bought by Dorel Industries last year – which is putting a shedload of effort into reinventing the brand. This year pro rider for GT Marc Beaumont took a downhill World Cup win on a GT Fury, so they must be doing something right. GT’s innovative ‘triple triangle’ design was born — the front and rear triangles overlap — purportedly reducing rear wheel vibration but certainly giving the brand its most distinctive look. It’s still around today and featuring on this Avalanche. But there are distinctive looks and distinctive looks. Russell Brand has a distinctive look, but it doesn’t mean we like it. We’re not saying the Avalanche is a weirdo, but it’s certainly not as refined as some of its peers (last issue we tested the Giant Talon 2 and Specialized Rockhopper, which both looked flashier than their ticket prices confirmed). The colour scheme is far from inspiring, the frame looks a bit dated and the saddle smacks of cheap-bike credentials. There’s a reason GT stuck with its tried and tested triple triangle design: marketing. Just kidding — it’s because it works. The Avalanche does have a noticeably comfortable ride, much smoother than the Specialized Rockhopper we tested last issue. There’s also a zero stack head tube and a replaceable derailleur hanger on the back so the frame isn’t a goner if you snap off your dangler on a stray root. Lets be fair though, the components on the GT are not cheap. In fact this is a decently specced bike with a basic Shimano crankset. Amazingly, those clever Yanks have managed to squeeze in a Shimano XT Shadow rear derailleur — just one model below the top-of-the range XTR. That’s something incredible at this price and the shifting is crisp and precise because of it, even in really gloopy conditions. We can’t help the feeling that they should have spread some of this extravagance around though, as the front mech is humble Deore. It’s like a football team splurging on a star striker, and neglecting the rest of the team. Newcastle United aside, the brakes are average for this price bracket, basic single piston Shimano units, although in the muddiest of conditions they lost a fair amount of their grunt as the brake pads fitted ground away to a thin, grey paste. This can happen to any disc brakes in the right (wrong, rather) conditions, mind. GT specs a RockShox Tora 302 coil fork with 100mm of travel. It’s by no stretch a light fork, made with steel uppers and magnesium lowers, but it does feel stiff because of that. It’s very effective at absorbing big hits and tracking the ground, although it was somewhat sticky to start with before the seals had bedded in. There’s also a rebound adjust dial so you can control how quickly the fork returns to its uncompressed length — useful if you don’t want to be bucked off as the fork pings back out. There’s a lockout function too, so road riding shouldn’t be too much of a grind. There’s a touch of overkill about the Maxxis Mobsters. It’s an old tyre that Maxxis has brought out of retirement, offering tons of sticky grip. Cornering is sure-footed and it’s pretty hard to make the rear wheel break away. However, there is a price to be paid — it’s one hell of a slow-rolling rubber number. On the road it saps your strength as it rumbles away at every turn of the wheel. Even off-road it’s too slow rolling for regular trail riding or cross-country use, so it’s out of character with the bike. Those Mobsters roll on Alex rims and GT All Terra hubs — the wheels are good and durable, and we’ve had no problems. The usual complaint though: they are heavy. On road, the GT is as comfortable as they come, thanks to a plush saddle, upright position and the ability to lock out the fork. 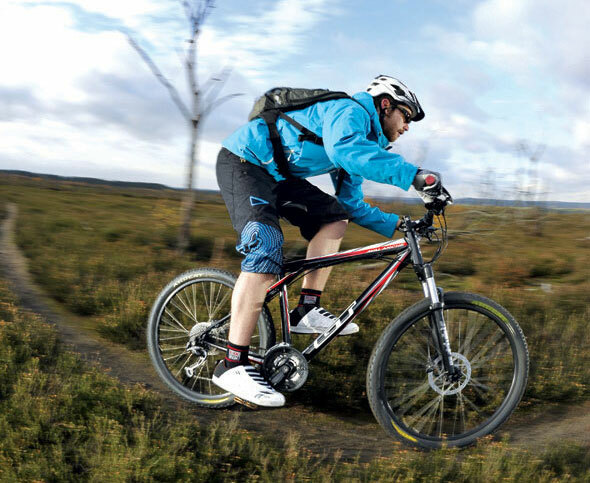 Off-road, it’s a capable machine thanks to that robust frame and well-performing fork. It’s let down though by its weight, not helped by slow-rolling tyres and the really sticky conditions we’ve been having of late. Trek has spent its budget a little differently to GT. There’s no showstopper rear derailleur; instead there’s Deore throughout, giving a more balanced approach. The US bike builder has invested in decent wheels, with Bontrager rims and spokes built around a Shimano hub. The components are all big-brand too, with Bontrager supplying the stem, seatpost, bar, saddle and even the tyres.